Guest Article THINGS THAT GO CHOMP IN THE NIGHT!! Most gardeners who grow the odd Rhododendron, would hesitate if asked to list the worst pest that affects their plants, then perhaps suggest Red Spider. These are often the cause of silvery leaves, particularly with Azaleas but there is a host of other nasties hiding in the shrubbery. Let’s begin with Lace Bugs, with a ten day breeding cycle, the population of these little horrors can explode into plague proportions very rapidly. 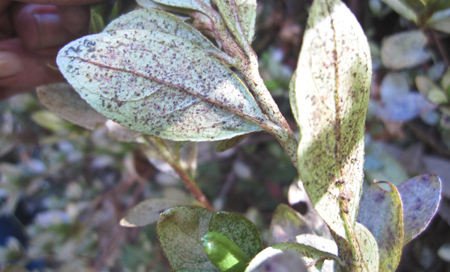 Affected leaves display the same silvery appearance as Red Spider but the adults can easily be seen under the leaves. They are a very slow moving creature about 3mm in length, having a single black dot on their transparent delta shaped wings. The larvae do the damage by sucking the sap from the leaf. Red Spider use the same method but are much smaller. Both can be controlled by using a systemic insecticide[e.g.] Confidor, sprayed as soon as [OR BEFORE] damage is apparent. In general, plants with indumentum (a covering of fine hairs or bristles) are resistant to sucking insects but not to caterpillars or weevils. Some gardeners will grow a control plant such as Cilpinense which is most susceptible, to indicate the time to spray. Plants in shady dry positions seem to suffer the most from the above. A word of warning...spraying with pesticide should only be must used as a last resort, as there always will be collateral damage to beneficial insects which prey on the offending ones. Also, only spray on calm days and wear protective gear, lest you finish up as a casualty , remember exposure can be cumulative. The presence of the afore mentioned weevil is indicated by clipped outer leaves, this is not that tragic in itself, although unsightly, it’s the greedy grubs under the ground eating the roots which are weakening the plant. Confidor tablets buried around the base of plants will fix this problem. Some rhodo’s are affected by leaf girdler moth larvae which is hard to detect until it has bored a hole in the stem and the sawdust is suspended in a web bag on the stem. These can be killed by pushing a thin wire into the hole but often it is easier to cut the stem off. Caterpillars from white cabbage butterfly enjoy eating the new growth on Triflorums. It is often easier to squash these when new leaves are seen to be joined at the top. There are a few other insects which cause minor damage such as leaf hopper and thrips but we are relatively lucky in Victoria so far. Of much greater concern, are water mould fungi which can be devastating to many plants including rhodo’s. Armellaria [ Honey Fungus ] with its orange yellow fruiting bodies can cover hundreds of hectares and Phytopthora cinnamoni, spores of which can travel in water are insidiously invading parks and gardens the world over. They are symbiotic with some trees and believed to have been spread by earth moving machinery which had worked in former orchards. Treatment for this condition is not readily available, most affected plants die. However it has been found that mulch, good drainage and dry conditions can delay or offset the impact of these diseases. 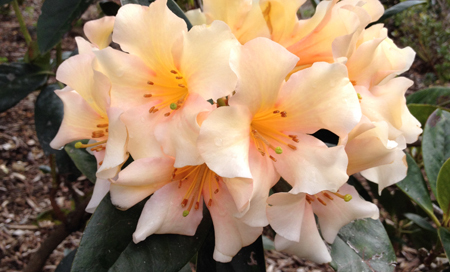 It is also worth mentioning that Rhododendron leaves are quite toxic and even goats will not recover if they eat a considerable amount of them.